The Oppo K1 has finally arrived in India with an in-display fingerprint sensor and an FHD+ display. The phone is priced at Rs 16,990. 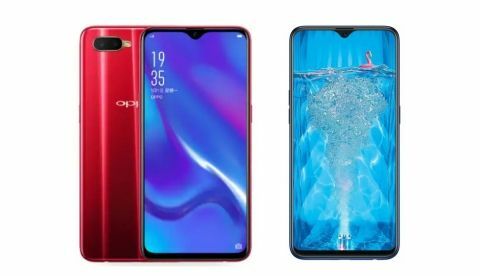 We are comparing the device with the Oppo F9 Pro to see which Oppo device is a better choice in terms of specifications, price, and features. Currently, the Oppo K1 is might be the most affordable device in the market that features an in-display fingerprint sensor. The phone sports a bigger 6.4-inch FHD+ display that comes with a tiny dew drop notch on top of it. We are comparing Oppo’s latest device with company’s another mid-range segment device Oppo F9 Pro, which carries almost the same design as the Oppo K1 and supports super-fast Vooc technology, which as per the company can provide up to 2 hours of talk time in just 5 mins of charging. Let’s see whether the new device by Oppo is a better option than the Oppo F9 Pro when it comes to hardware at least on paper? The Oppo K1 sports a bigger 6.4-inch display that offers a resolution of 2340 x 1080 pixels. The display has a tiny drew drop notch on top of it, which houses a 25MP front camera. The Oppo F9 Pro has a slightly smaller 6.3-inch screen, which offers a resolution of 2340 x 1080 pixels, same as the Oppo K1. When it comes to the processor, the Oppo backed its K1 with a Qualcomm Snapdragon 660 processor, which is coupled with 4GB RAM and 64GB internal memory. For now, the phone is launched only in 4GB/64GB storage model. On the other hand, the Oppo F9 Pro is backed by a MediaTek Helio P70 chipset paired with 6GB RAM and 64GB internal memory, which is expandable to up to 256GB via a microSD card. The Oppo F9 Pro comes in two variants 6GB/64GB and 6GB/128GB storage models. As far as the cameras are concerned, both the device comes with a dual 16MP + 2MP camera setup on the back. The 2MP sensor on both the device can be used for depth sensing. At the front, both the of these devices consists a 25MP unit for clicking selfies. 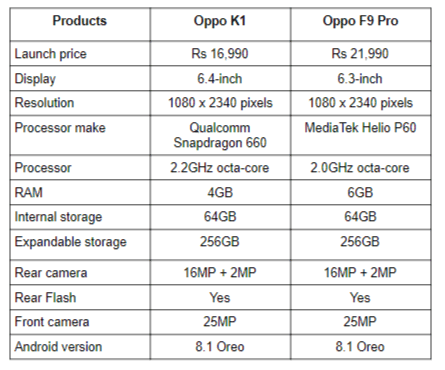 The Oppo K1 is launched in India at a price of Rs 16,990, while the Oppo F9 Pro is starting in India from Rs 21,990.